This RFID tutorial covers RFID basics including RFID terminologies, what is RFID? , RFID frequencies,RFID network, factors in determining RFID network, RFID cost, RFID applications,RFID vendors/manufacturers and more. RFID Tag- There are two types of tags, passive and active. Tags are used to identify people/device/object and tied with them. 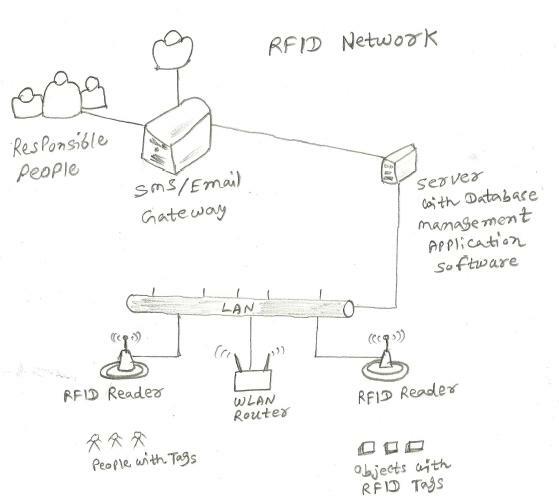 Active tags send radio waves to the RFID reader and hence will inform about its location. Passive tags reflect the radio waves transmitted by RFID reader and hence reader will come to know about location of the tags. Passive tag usually will have coverage of about 3-5 meters while active tag will have coverage of about 100meters. Active tag has power source. Passive tags do not have internal power source/battery. Hence passive tags rely on power of the active tag, which passive tags obtain wirelessly using E-M waves. class 1 generation 2 tags are backward compatible to generation 1 class 0 & class 1 RFID tags. RFID reader- The readers usually are mainly active type and will read information either transmitted by RFID tags or reflected by them. RFID reader usually is interfaced with computer. RFID stands for Radio Frequency Identification. As mentioned RFID devices use radio frequency waves to communicate. The common method used to identify person/object is to use serial number for each tags. Other information can also be customized as per the requirement. RFID tag usually will have smaller micro-chip along with the antenna. RFID tags communicate with the reader with the help of antenna. The reader converts reflected or transmitted information from tags to useful digital information which can be further processed by software running in the computer. RFID works on different frequency bands, mainly in UHF frequency range. RFID network operates based on three main frequency bands mainly LF,HF and UHF. Following table summarizes these frequencies and their applications. There are two major factors which help building the RFID network, coverage and number of objects/people. Let us understand RFID with the example of school tracking. For school management RFID is mainly used for student attendance management and for their movement notification. All these via real time SMS or E-mail. Here each Student is given a RFID Badge. This badge will contain student photo and other vital information. As depicted in the figure, RFID tags provided to students communicate with RFID reader. This reader having TCP/IP features interfaced with LAN and LAN intern connects with the server. This server is interfaced with SMS gateway. This gateway takes care of delivering SMS/Email to the authorities/parents. As per the layout entry and exit points of the school premises are installed with RFID reader. Once the student enters/ leaves the school premises, the RFID reader will capture all the information and the data is given to server for validation. After validation, SMS or Email is generated and sent to the registered mobile. To cater any requirements of the RFID, following factors are needed by system integrators or RFID suppliers. 1.How big is the Area? This required to decide RFID tag type active or passive. 2.Where do they want to track the objects/people? This helps in decoding RFID reader location as well as number of readers. 3.How many number of objects/people are there? This helps in designing data base requirement in the GUI software running in the system attached with the RFID reader. 4.How are tags to be embedded with objects/people? i.e. in ID card, wrist band or to be stitched in the uniform etc. This helps address the requirement accordingly. Typically RFID passive tag costs about less than a dollar and RFID active tag costs about 25 dollar. RFID reader comes with about 500-700 dollar depending upon the features. RFID vendors/manufacturers provide RFID tags and RFID readers, which need to be used for various RFID applications as mentioned. Refer RFID tag page for more information.